Well-made mount in the shape of an acorn. The upper surface is convex; the cup is decorated with oblique rows of pellets, and the kernel has small grooves making shading as it disappears into the cup. On top of the kernel is a little knop. The stalk is unusual; it is large, and curves around to become a bird's head, with a dot eye and pointed beak. 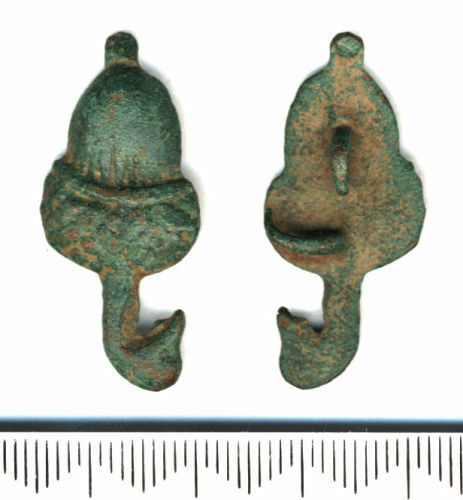 The reverse is flat, apart from the knop which is rounded; there are two bent-over attachment spikes. It has a nice mid-green patina.